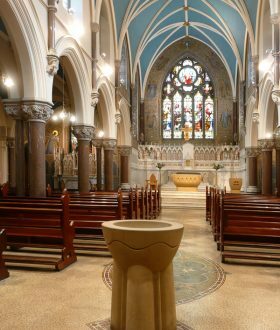 On 14 February 1896, Father Robert Crickard was appointed the first parish priest in Holy Rosary Parish. 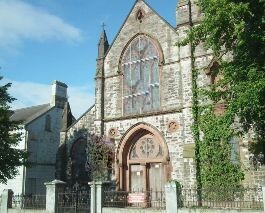 The first church was dedicated on 9 October 1898, to serve the growing population in south Belfast. Rosario Hall had previously served as a Mass centre and school, the Crown School. The Good Shepherd Sisters came to Belfast in 1867 at the invitation of Bishop Dorrian. At first, they lived in Bankmore Street before moving to Ballynafeigh. Due to changing circumstances the sisters moved from the original buildings and church to live and work in various places and ministries. The foundation stone for the Good Shepherd Church was laid by Most Rev Joseph MacRory in March 1914. The outbreak of war interrupted the work many times. By 28 August 1917, the main structure was completed and in use for Mass. Mass was celebrated on a temporary wooden altar. The new chapel was solemnly dedicated to the Sacred Heart of Jesus by Bishop McRory on 18 April 1920. The Good Shepherd sisters and community used the church for almost sixty years. By late 1970s, the chapel was too large for the religious community. By contrast Holy Rosary Church was too small for the expanding congregation of Holy Rosary Parish. In 1980 Archdeacon Robert Murphy took over the chapel of the Good Shepherd Convent, altering and adapting it for parish use. Bishop William Philbin dedicated Good Shepherd Church for parish use on 7 October 1980.